Heat grill. Place onions in 9 1/4x6 1/2x1-inch disposable foil pan. Drizzle with melted butter; sprinkle with brown sugar. Cover loosely with foil. When ready to grill, place foil pan on gas grill over medium heat or on charcoal grill 4 to 6 inches from medium coals. Cook 15 minutes. Uncover; stir onions and cook an additional 15 minutes or until onions are tender. Dot onions with small spoonfuls of cheese spread; sprinkle with bread crumbs. Cook, uncovered, about 5 minutes or until cheese is melted. To bake onions, assemble recipe in 8-inch square ( 1 1/2-quart ) baking dish; cover with foil. Bake at 450°F. following procedure and times as listed in recipe. "Au gratin" is a French expression that refers to foods garnished with bread crumbs, cheese and butter, and browned in the oven. "Gratin" refers to both the food and the baking dish. Gratin dishes have low sides and large surface areas to maximize browning. 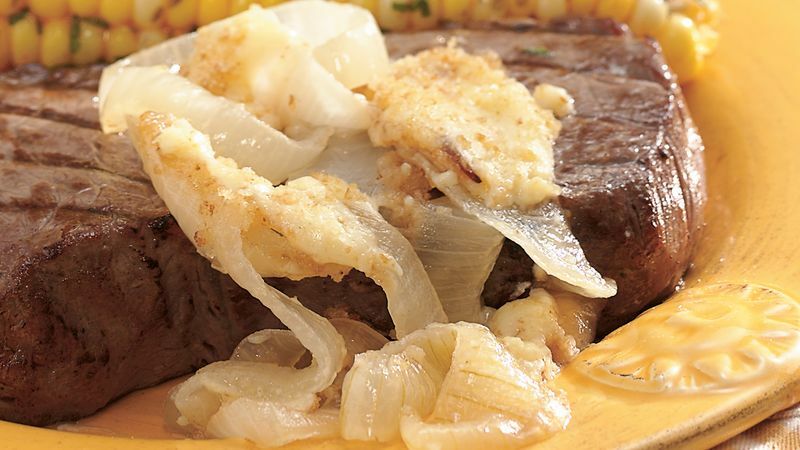 Serve these mild onions with grilled steak.